Google Flights is a solid tool for booking travel. 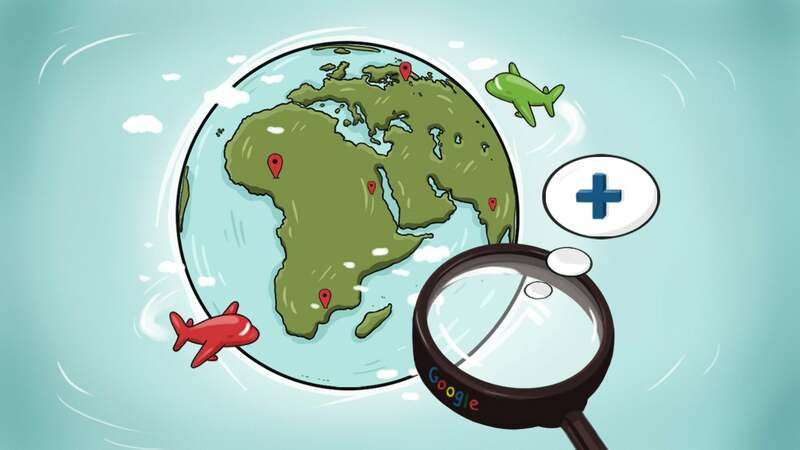 You're probably already familiar with its basic functions, like finding the best price for flights and browsing flexible dates that can save you money and time. However, there are some other, lesser-known features that can help you squeeze even more out of your travel budget. Photo by Fruzsina Kuhári. Let's say you know where you want to go, but you don't know when. Maybe you want to sip Mai Tai's in Hawaii, but you can't afford to spend a lot on a ticket in high season. You could research the cheapest months to fly, on average. Those estimates are usually pretty accurate, but obviously, your actual results might vary when it comes time to actually booking your tickets. 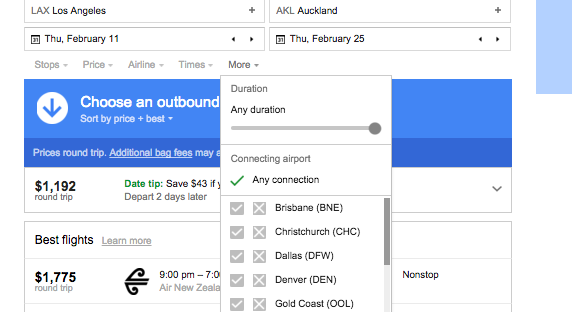 Instead, plug in your destination from Google Flights, select "flexible dates" and you can browse real, current prices by month. The "flexible dates" tab shows you a calendar view of fares, but the price graph will give you a more visual, general idea of prices. It's also a little easier to navigate, because you can see a wider and more specific range at once. Going back to the Hawaii example, you can see that prices get crazy around July and September, so if you're trying to save some cash (and avoid a bunch of tourists), you'll want to skip those months. Instead, you might consider booking your trip in March or May. Besides, the weather is just as nice, if not a little less swelteringly hot. Maybe you know when you want to travel, but you're open to destinations. Let's say you can only take holiday in May, and you just want to get away for a couple of weeks — without going broke. 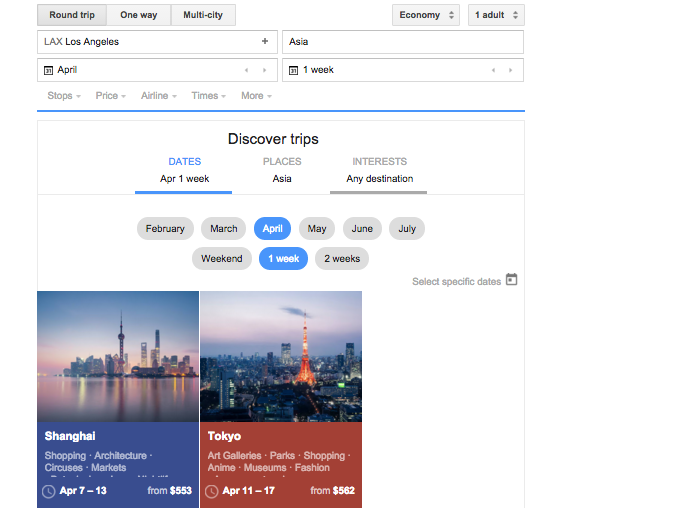 Google Flights recently released a new tool that lets you find destinations based on month and duration. Navigate to the "Discover Trips" window, then instead of selecting exact dates, select a month and a general time frame: weekend, 1 week, or 2 weeks. The tool will populate a list of popular destination cities and prices. You can even filter by region (North America, Asia, Oceania and so on) or interest (honeymoon, food, adventure, wildlife and so on). If you want to take a food-focused holiday in North America, for example, you'll get a list of affordable cities where you can munch all day. It's also fun to explore the map version. To get there, click on any destination, select "Show Flights", and you're taken to the general Google Flight search result screen, like the one shown below. From here, there's a snippet of a map that gives you the option to "Explore Destinations". You get a map view of destinations and prices around the world, sort of like Kayak's Explore tool. You can then adjust the dates to see how prices fluctuate, and the tool even gives you a general idea of prices. 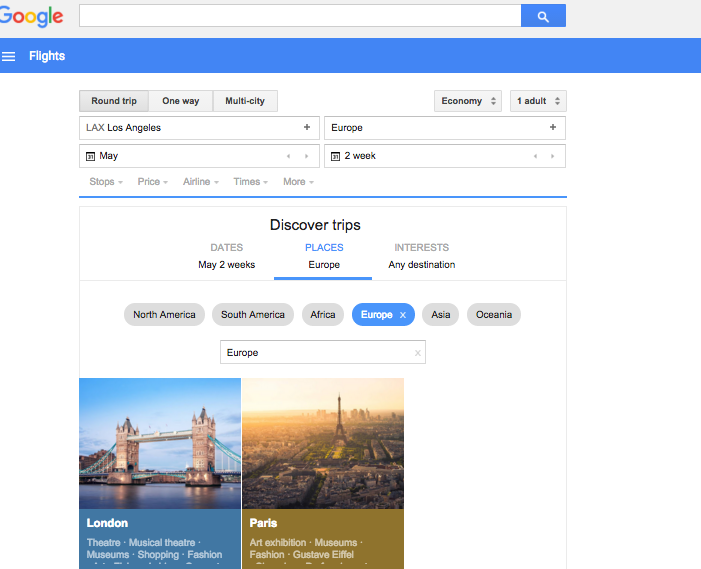 You can also navigate to the Explore map via the Google Flights main page. Just click directly on the map or navigate to the options menu and select "Explore map". If you're feeling adventurous, you can enter your origin city and dates, then hit "I'm feeling lucky", and Google will choose a destination for you, based on your search history and what's popular. Regardless of the trip you're planning, it's smart to start tracking flight prices as early as you can. Prices fluctuate quite a bit, and you want to swoop in and scoop up the best deal. Browse your flights as usual, pick a departing and returning flight that look good, then select "Save This Itinerary". 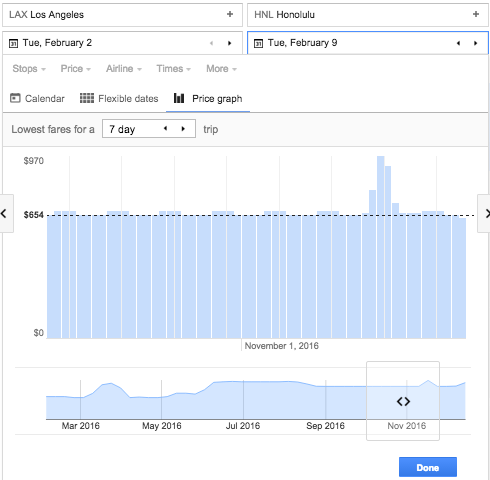 Google Flights will keep track of all of your saved itineraries in one spot, and you can see how the price changes every day. You can also get alerts via Google Now when prices change. I've also used this feature to save some money myself. When I was planning my trip to Japan, for example, I saved a handful of different itinerary options that varied by day, flight time or even airport. Every week or so leading up to the trip, I checked how the prices fluctuated and then picked the cheapest option. It's fun to explore destinations by region, too. For example, if you know you want to travel to Asia, but you're not sure where, simply type in "Asia" in the search box, select a month for travel and Google Flights will list destination cities in that region, along with their prices. This is also useful if you're visiting various cities and looking for the cheapest city to fly into. If you're planning a trip to the the UK, for example, you may be travelling to Glasgow, Cardiff and London. It's easy enough to travel between cities once you're there, and you can save quite a bit by flying into one city versus another and just tweaking your itinerary based on where you land. One of my favourite ways to use Google Flights is for finding "hidden" layover cities. This is basically finding a flight with a long layover in a different city. This way, you get to enjoy a whole other city on the way to your destination. It's like a holiday bonus! To do this, run a flight search as usual. Under the "More" tab, you'll see a list of stopover cities you can select or deselect. If you want to search for all of them, select "Any Connection". Then, make sure you have "Any Duration" selected, then run your search. This way, the longest layovers show up in your search results. The layovers aren't incredibly long (the longest are about eight to nine hours), but that could be enough time to explore a city on your bucket list. I also used this trick during a recent trip to North Carolina so I could have lunch with my parents in Houston for a few hours. If you're looking for a longer stopover, you'd have better luck using the "Multi-city" option (although that's not really the same thing, since you're just booking separate tickets to different cities). It's worth pointing out that this is basically what Skiplagged and CleverLayover do, too. However, the flights Google shows are true connecting flights (and not just flights that are scheduled to land and take off after one another,) so if there's a delay or the flight is cancelled, you probably have more options. 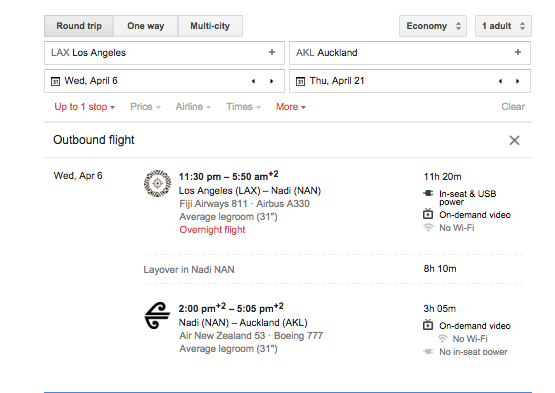 Plus, Google makes it a bit easier to book those flights outside of their tool. If you're a fan of travel rewards, you'll like this one. 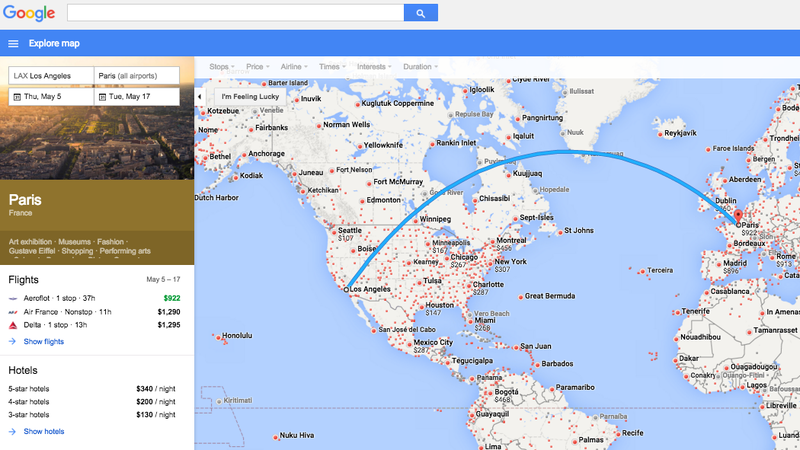 Google recently added a tool that makes it easy to search based on airline miles. Under the "Airline" tab, you can search for flights by a particular airline or alliance. An alliance is basically a rewards networking program that includes a bunch of different travel rewards programs. 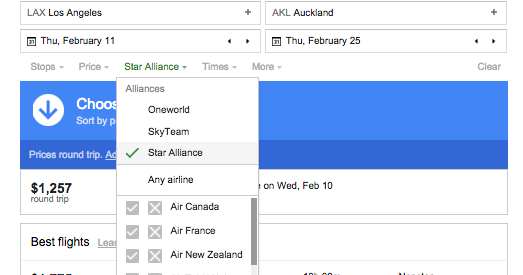 This way, if you're a United MileagePlus member in the Star Alliance Network, you can select "Star" as the alliance, and Google Flights will show you all the related flights in that network so you can earn (or use) points for the flight. Google's new Flights update make it incredibly easy to explore and plan your trip accordingly. While there are a number of handy tools and services out there to help optimise your travel, it helps to have some of these fun features in one spot. Great tips, looks like a powerful tool!